Border Patrol agents Saturday detained 13 Mexican citizens found in a boat not far from the La Jolla shoreline, according to a U.S. Coast Guard official. Photo via OnScene.TV. 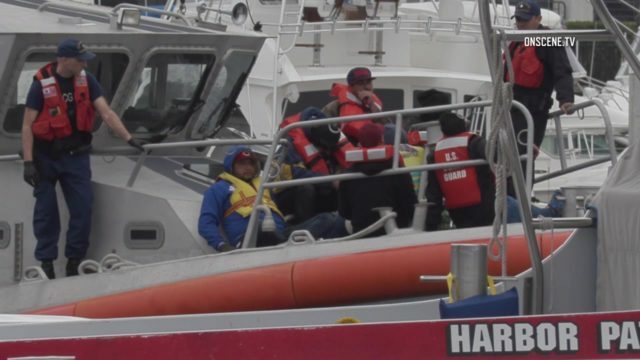 Border Patrol agents Saturday detained 13 Mexican citizens found in a boat not far from the La Jolla shoreline, according to a U.S. Coast Guard official. Petty Officer Robert Simpson said that around 6:45 a.m., a panga boat was observed a half-mile off the coast south of the Children’s Pool in La Jolla. Simpson said his understanding was that 12 men and one woman were on the boat. The Coast Guard and San Diego Fire-Rescue lifeguards worked to transport the passengers to shore at Mission Bay. U.S. Customs and Border Protection agents then took the passengers, waiting at a lifeguard station, into custody, Simpson said. Attempts to reach the CBP for comment Saturday were unsuccessful. According to an NBC7 report, CBP officials said the Mexican citizens were thought to be attempting to illegally enter the United States.